Purple sea star. Photo by brewbooks. Creative commons Attribution-ShareAlike 2.0 Generic (CC BY-SA 2.0). 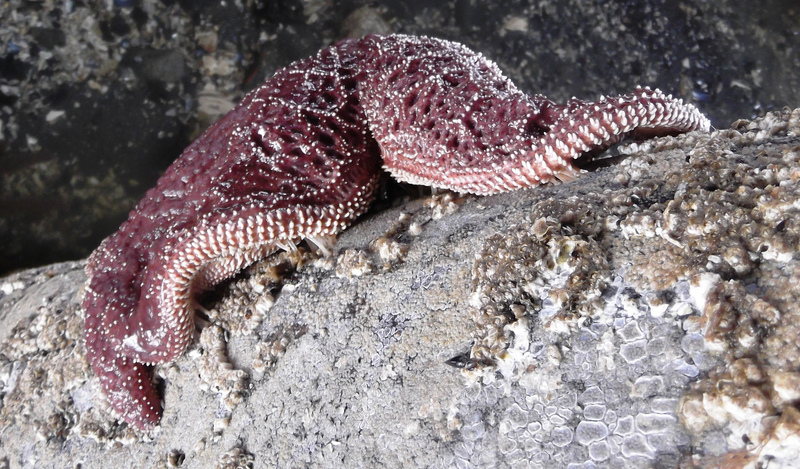 Populations of at least 20 asteroid species on the Northeast Pacific Coast have recently experienced an extensive outbreak of sea-star (asteroid) wasting disease (SSWD). The disease leads to behavioral changes, lesions, loss of turgor, limb autotomy, and death characterized by rapid degradation (“melting”). Here, we present evidence from experimental challenge studies and field observations that link the mass mortalities to a densovirus (Parvoviridae). Virus-sized material (i.e., <0.2 μm) from symptomatic tissues that was inoculated into asymptomatic asteroids consistently resulted in SSWD signs whereas animals receiving heat-killed (i.e., control) virus-sized inoculum remained asymptomatic. Viral metagenomic investigations revealed the sea star-associated densovirus (SSaDV) as the most likely candidate virus associated with tissues from symptomatic asteroids. Quantification of SSaDV during transmission trials indicated that progression of SSWD paralleled increased SSaDV load. In field surveys, SSaDV loads were more abundant in symptomatic than in asymptomatic asteroids. SSaDV could be detected in plankton, sediments and in nonasteroid echinoderms, providing a possible mechanism for viral spread. SSaDV was detected in museum specimens of asteroids from 1942, suggesting that it has been present on the North American Pacific Coast for at least 72 y. SSaDV is therefore the most promising candidate disease agent responsible for asteroid mass mortality. Hewson, I., J. B. Button, B. M. Gudenkauf, B. Miner, A. L. Newton, J. K. Gaydos, J. Wynne, C. L. Groves, G. Hendler, M. Murray, S. Fradkin, M. Breitbart, E. Fahsbender, K. D. Lafferty, A. M. Kilpatrick, C. M. Miner, P. Raimondi, L. Lahner, C. S. Friedman, S. Daniels, M. Haulena, J. Marliave, C. A. Burge, M. E. Eisenlord, and C. D. Harvell. 2014. Densovirus associated with sea-star wasting disease and mass mortality. PNAS online November 17, 2014, doi: 10.1073/pnas.1416625111.